Once again I am on the N7, turning off onto the R45, heading into the wonderful West Coast, this time to Hopefield. As Table Mountain fades into the distance behind me, I start becoming aware of my surroundings. I take in the very gentle rise of the hills dotted with the first few wild flowers. I notice the clarity of the colours in the copper, gold and bronze fields, and the deep green rectangles of lucerne, all framed by rich red earth. I open the windows and it smells like the holidays. The air is clean and carries hints of farm life. The occasional whiff of cow manure mingles with the scent of aloes. The sun streaming into the car combined with the open space all around me is so relaxing that just driving is like a tonic. Then I spot that lovely sight of the wind farms, the beautiful white turbines reaching into the sky and catching the energy from nature. I know I am almost in Hopefield. This is a good thing as by now I am practically comatose I am so chilled. This soporific state lasts only as long as it takes for me to park and get out of the car at Simply Bee. Lizana from Simply Bee bursts out of the building, her bear hug of a welcome is so energizing she should be sold to Eskom! Although the town was named after two land surveyors called Mr Hope and Mr Field, the name is very apt. Hopefield shows me that even in 2015 it is possible to live in a way that is in complete harmony with nature and the environment. The people here are industrious without being hurried. Stress is not a common complaint and they all have that one commodity us city dwellers find so elusive. They have time. Time to drink a cup of coffee outside, time to chat to a neighbour or help a friend. Time to have a life. This is not to say that Hopefield is a sleepy backwater. This delightful town built around the Sout River is a celebration of nature that embraces the modern technology when it needs to. The wind farms, internet companies and responsible tourism ethics are more advanced than in many cities, and the Merry Widow guest house is the very last word on urban hip in its décor. It also has the biggest, most complicated coffee machine I have ever seen. Simply Bee is a successful family business started in 1954 when Derick Hugo became a Bee Keeper. On retirement Derick and Marie resettled in Hopefield and manufactured and sold the honey. In 2008 their daughter Helena and her husband Pierre van der Westhuizen took over the business and built it into the award winning company it has become. Helena lived in the USA for 22 years and worked as an interior designer. 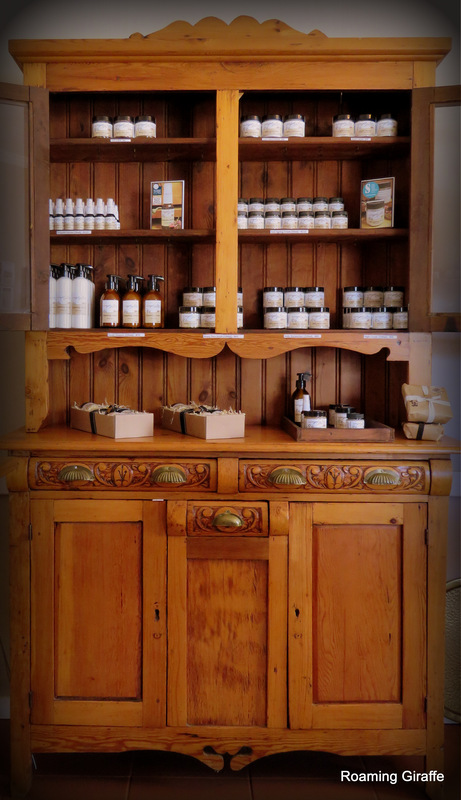 This talent is very evident in the Simply Bee showroom which seems to glow in the sun from the colours of the honey and the warm woods of the beautiful old cabinets, sideboards and tables used to display the huge variety of products. Shortly after her return to Hopefield, Helena had a bad fall that immobilised her for a number of months. 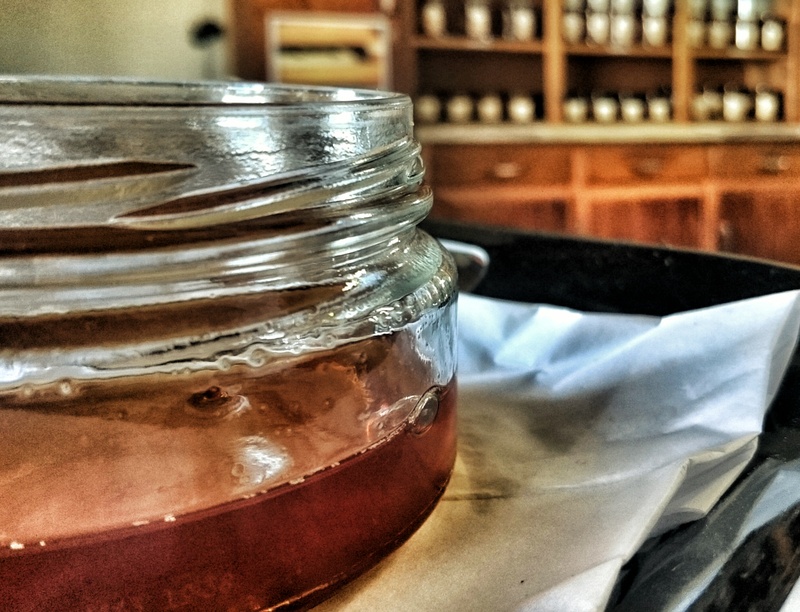 During this time she started experimenting, or as she says playing, with beeswax and propolis with a growing excitement. Being raised in a family of bee keepers her basic knowledge was obviously already solid, and her passion for the bees is evident when she talks about them. Helena started seriously educating herself about everything related to bees. She talked to bee keepers, she read scientific journals, conducted her own experiments, and observed her hives. Then she did a course in Essential Oils given by a respected expert in Riebeeck Kasteel, as these natural oils complement and enhance the beeswax and propolis products. Helena is one of many women who have a very sensitive skin, so her first experiments were products that she could use herself. They worked well and she started giving them away as gifts. The gifts were very popular and the news spread via word of mouth and suddenly there was a growing demand. Helena’s dream was to create a range of products that were suitable for sensitive skins, but more importantly, were priced so that all women could afford them. With a good product at the right price, growth is inevitable and Helena went from word of mouth sales to selling at all the local markets. This expanded to stocking various pharmacies and shops in the area and now most sales are done online. The range consists of over 60 products. A full range of skin care products for women, many containing that wonder ingredient propolis. Men and babies have their own special range of soaps, creams and lotions. Candles, soaps, body balms, nail creams and hair care make wonderful gifts and are very affordable. Pure and Raw Fynbos honey is a healthy choice for the whole family. There is even honey for kids presented in a teddy bear shaped bottle. For the home, linen and room mists are the perfect natural alternative to chemical fresheners, and the leather and wood polishes make housework eco- friendly. For animal lovers there is hoof balm for your limping horse, or swarm lure for bee keepers. For outdoor enthusiasts the insect repellent does the job very effectively. Fill up your First Aid box with natural antiseptics and ointments that work. Simply Bee products can be purchased from 190 stockists in South Africa and the company exports to the UK, USA, Namibia, Zimbabwe and Mauritius. Simply Bee has created employment for eleven local residents so far, and they source all other suppliers and support services from the area. 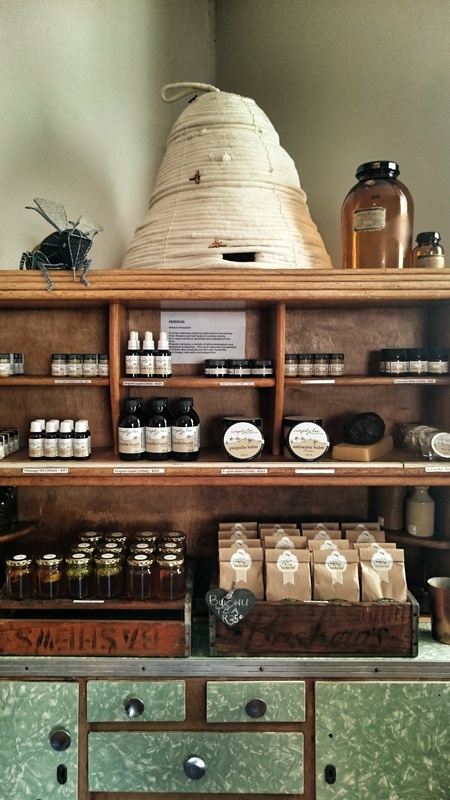 Simply Bee is honey badger friendly and all their hives are placed on stands. The bee hives are in fynbos rich areas where no commercial farming occurs. This means they are not exposed to any chemicals, making their honey 100% organic. Conservation and the purity of their products are foundation of the company. All natural ingredients are only taken from plentiful renewable sources. Helena personally controls the production process and ensures that distillation, extraction, steaming and hydrolysis are kept to an absolute minimum to retain the natural purity. The Simply Bee Observation Centre provides education and awareness of the important role that bees play in our lives and the benefits of honey and other products. Bring honey and bees into your daily life. To encourage bees to your garden, plant Lemongrass. Bees love it as the Queen bee has a phenorome that smells like lemon, this attracts them to the plant. A garden full of bees is a happy, healthy garden. It is the only source of the antioxidant, pinocembrin, which is associated with improved brain function. Honey contains enzymes, vitamins, minerals and water. Did you know that you could live on honey and nothing else? People suffering from allergies can also try this remedy but must use locally produced honey as this helps to build up your immunity. Mix 1 teaspoon of honey with half a cup of luke- warm water and two teaspoons of lemon juice. Drink daily.This allows the body to absorb the good fats and eliminate the bad fats fast. 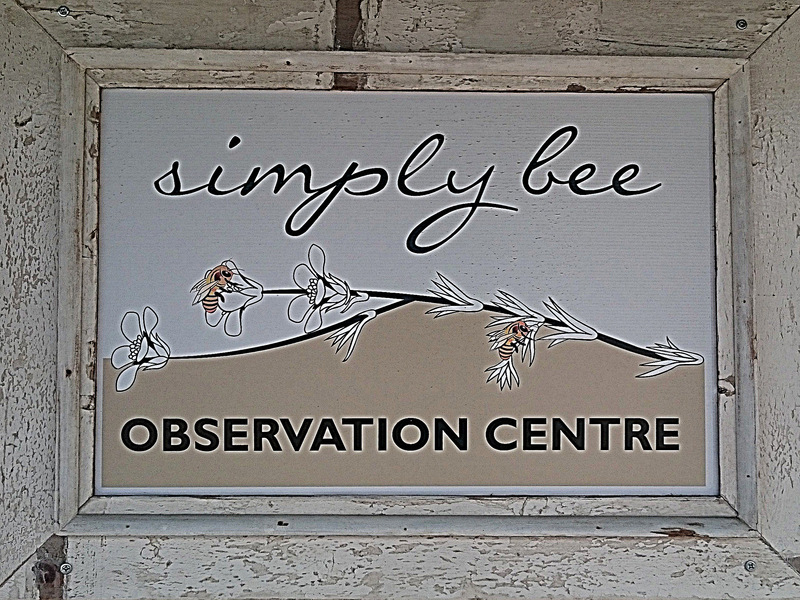 The Simply Bee Observation Centre. This educational, interactive experience teaches everything you ever wanted to know about bees. A hive has been opened on one side to reveal the intricate workings of the colony. It is observed from behind glass for the safety and happiness of both visitors and the bees. The back door to the observation room is open so the bees are free to come and go as they please. Honey tasting is offered after the talk. Packages are available for schools, study groups or tourists and picnic snacks and drinks are included. Booking is essential. Simply Bee also has a room dedicated to farms they work with in the area. Displays run for a month and feature one farm at a time. Historical items displayed range from furniture and clothing to old photographs, documents, books and toys. A little story about the featured farm is given. The tourism office and museum has a fascinating display of memorabilia from the past. One wall is dedicated to a vast collection of old cameras, while another section has some scary looking old medical and dental equipment. Victorian dolls, little girls dresses and stylish accessories will thrill fashionistas, and foodies will enjoy the large table filled with tins, kitchen utensils and crockery. If you are planning to visit Hopefield, do it on a Saturday so you can mingle with the locals at the fresh produce market. It is just past Simply Bee, look for the big red doors. 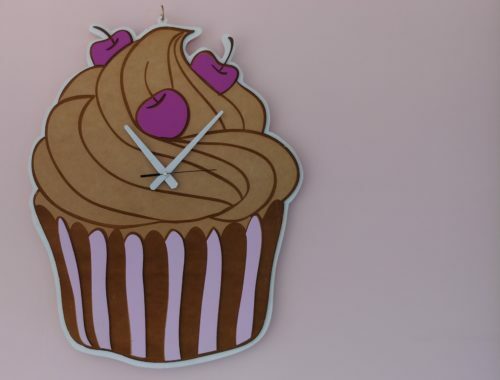 All sorts of delectable goods are for sale, produced by locals. The market is a great initiative that benefits the whole community. Don’t leave Hopefield without a visit to the N.G. Church. 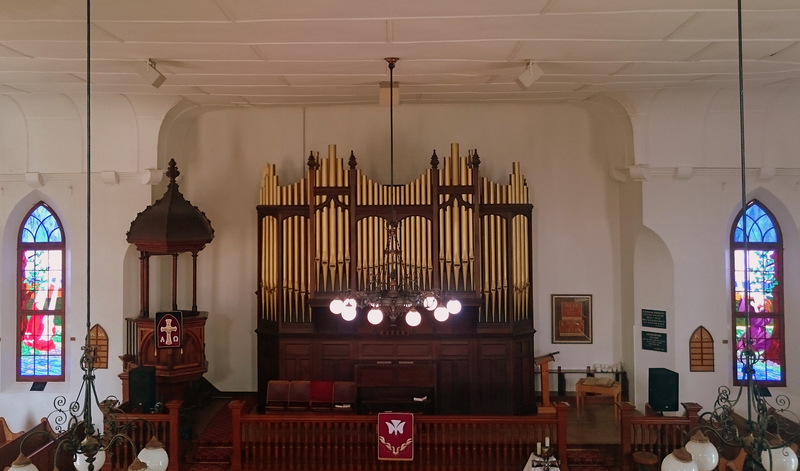 In 1911 the Forster & Andrews Organ was purchased from England. This organ is so huge that the church had to be enlarged to accommodate it. It is a beautiful piece of craftsmanship, and is still used every Sunday. 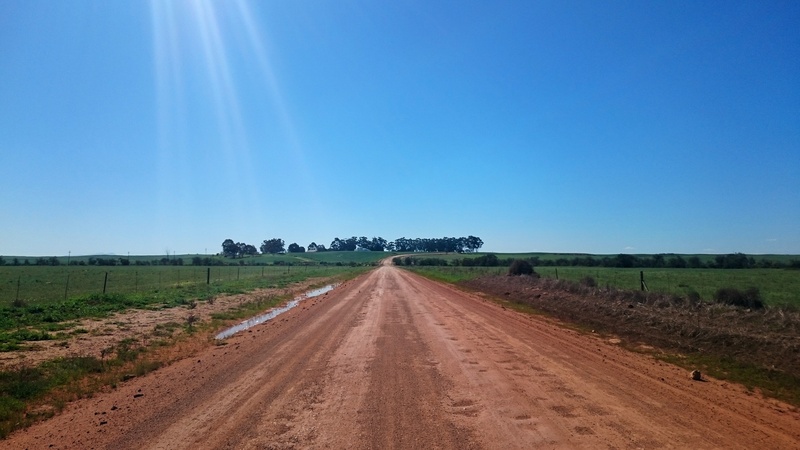 A few kilometers out of town you will find Die Plaasmol. It is not easy to describe but I will try. 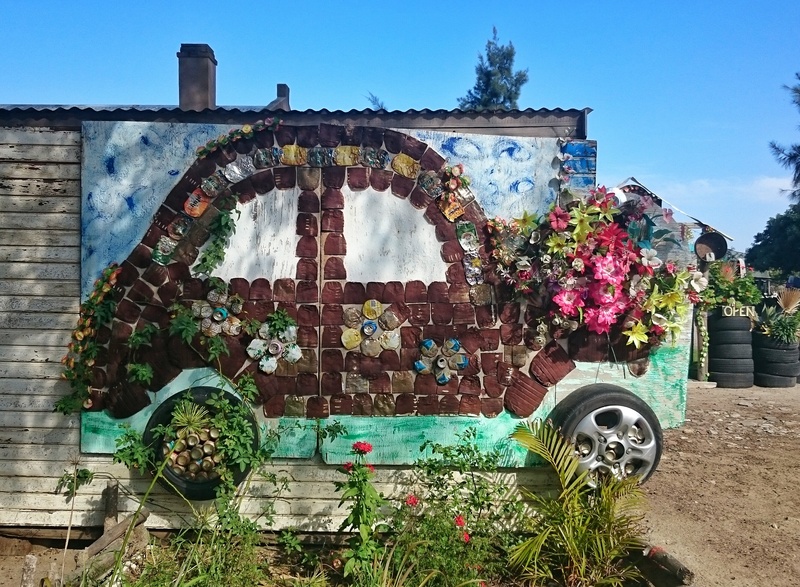 Lovely gardens, the most creative recycling I have ever seen, a tea room, a pub, a number of little shops loaded with goods ranging from gifts to preserves, clothing to plants. It would probably take a day to explore this area properly. 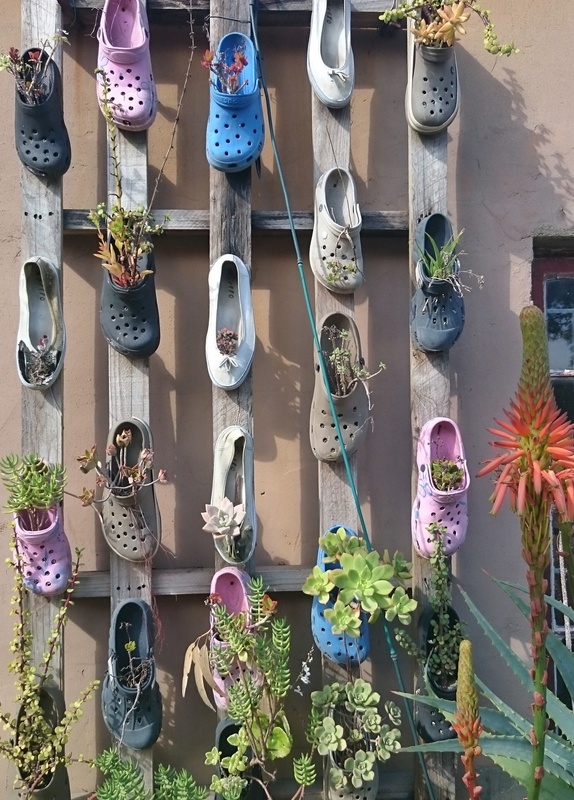 The owner, Fransie Russouw is happy to share her ideas as she believes EVERYTHING can be recycled.Camping sites are available and a huge covered area is available for functions. This place is well worth a visit, kids will love it and can run free while parents shop or just relax in the shade and enjoy something to eat. Thanks to WestCoastWaySA for hosting me in Hopefield. Gorilla Trek. 10 things I’m looking forward to that don’t include gorillas. New Travel is inspired by a photogenic dish, drizzled with an infusion of foreign accents.